Nice! I wonder if they'll also upgrade the other Premingers in that old Film Noir Classics box (Fallen Angel and Whirlpool). Includes Fallen Angel, Whirlpool, and Where the Sidewalk Ends. Whirlpool on Blu-ray AND with a Martin commentary? Thank you world! Please note that two of the Martin commentaries are ported from Australian releases, only Where the Sidewalk Ends is new. While I welcome this, it's with great reservation. We really need to know what are the sources and (if) any new scan or remastering work has been done on them. I bought the BFI dvds back when and then regretted the expense because they were so outright bad - severe cropping being one of their many sins. Then Fox released the same titles in far superior DVDs in the old Noir series (plus Eddie commentaries) so it was all a double dip. Never again, but maybe BFI would be kind enough to tell us what they're using for the masters on these and indeed Night and the City. They are very unlikely to get Criterion's own new 4k I would imagine. On the latter I took no chances, as I already have the German Die Ratte von Soho BD, yet another double dip into Crit was only necessary for the extras and the 2k of the BFI Brit version, and in this case it was worthwhile. Considering the massive gap in PQ between the BFI and the Lobster/Flicker Alley Dziga Vertov BDs I won't be easily parted from my money for BFI these days. Here is the BFI's answer about the masters used for the Preminger set : Fallen Angel, Whirlpool, and Where the Sidewalk Ends have been scanned at 2k and delivered in High Definition. So no 4K Fox restorations it seems. Another question is whether DVD Beaver will get a review up for us in time to cancel preorders if needed. Sometimes Gary's reviews go up a couple weeks before street date, other times no such advance notice. Blu-ray.com reviews rarely go up early as far as I've noticed. I preordered the set because I can't foresee Fox releasing these films themselves, and even if eventual Twilight Time releases may prove superior, three separate TT releases would cost me about double what the BFI set did, so I couldn't justify that. And there's no guarantee of that even happening. I don't understand what David meant about the "severe cropping" on the 2004 BFI discs. I never saw or compared them myself, but the Beaver comparisons don't show any such loss of image. I guess the next question to ask is whether the BFI performed the remastering themselves or if Fox were involved. For the record, all 3 of these titles are available to hire for home video distribution at Hollywood Classics from Fox, and Where the Sidewalk Ends is listed as 4K. Personally I doubt there's anything to worry about and that these transfers will represent the best the BFI and Fox have to offer. I imagine the claim that WtSE is 2K is simply a mistake. Me : Will the Preminger Blu ray set be sourced from the recent 4K restorations (like Where the Sidewalk Ends shown at The Reel Thing, LA) ? BFI : Fallen Angel, Whirlpool and Where the Sidewalk Ends have been scanned at 2K and delivered in High Definition. Me : So, no 4K scan ? These aren't the masters currently hold by Hollywood Classics then ? BFI : Night & The City was scanned at 4K while the Preminger titles were scanned at 2K. All are licensed by 20th Century Fox. tenia wrote: Here is the BFI's answer about the masters used for the Preminger set : Fallen Angel, Whirlpool, and Where the Sidewalk Ends have been scanned at 2k and delivered in High Definition. Thanks for persevering with the wait for an answer Remy. Three weeks to answer you is nothing when someone like me is obviously persona non grata with BFI, or at least someone not suitable to respond to. I think that's both good news and not so good news. Assuming - who would know? - it's in safe hands like David MacKenzie's the new 2k and encodes should be very good. What's not so good is that even MoC managed to secure a 4K from Fox for their BD encode of Pickup on South St, just as Twilight Time secured a 4K for the new House of Bamboo. Nick, I very much doubt there will be Fox intervention via Schawn Beltston. I can only assume these are all scanned and mastered in house. So I have to assume in the absence of any information from the BFI the new discs promise good things - like no more cropping or manipulated black level, or poor grain management. But they aren't optimum given the current Fox practice of 4K masters. EDIT: Your last post seems to suggest Fox themselves did the 2k scans. I will still wait for reviews on these. 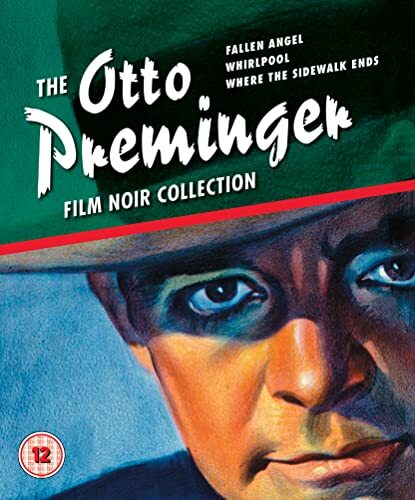 Released on 28 September 2015, this Limited Edition box set brings together three of acclaimed director Otto Preminger’s greatest films for the first time on Blu-ray. Presented with essential extras, including audio commentaries, these classic films deliver a unique combination of intrigue, moral ambiguity and stylish photography which truly define the influential film noir genre. In Fallen Angel, Dana Andrews stars as a down-on-his-luck press agent turned amateur sleuth, investigating the murder of the sultry waitress, Stella (Linda Darnell). Whirlpool is a fascinating blend of noir and woman’s picture, starring the beautiful Gene Tierney as a troubled socialite who falls prey to the machinations of a sinister hypnotist (José Ferrer). Whilst in the downbeat Where the Sidewalk Ends, Dana Andrews again stars as a tough cop whose brutal methods leave a trail of murder, deceit and cover-ups. They all look good. Mr Belston is clearly supervising the new scans for Fox. All the cropped head room and Left of frame information is rectified as well. Fallen Angel appears to be from lesser source elements than the other two, both of which are stupendous, but it's still a nice upgrade. Cannot wait to get my hands on this. That's interesting, was this a case like Letter to Three Wives where Fox's team had to work from a mix of dupe and fine grain with no O-neg? As Nick notes above, Where the Sidewalk Ends and Whirlpool both look like brand new 4ks from O-negs. Fallen Angel which I now regard far more highly than previously looks only very minutely less impressive than this, in all likelihood the result of being scanned from a mere fine grain Archive positive 35mm. I will definitely still keep the Fox DVDs for Eddie's commentary tracks, although it's probably worth noting Adrian covers a great deal of similar if not the same ground in his commentary for Fallen Angel at least. I think Eddie's tracks just set the benchmark that high. Interestingly enough, the booklet still says that the movies were scanned and restored in 2K. I thought Where the Sidewalk was a 4K scan? The others are certainly 2k. All three come in around the 20 gig/30 mgbps or lower mark so they make optimum use of bandwidth. The first two have more la Shelle photographic "lustre" and could for all the world be 4Ks in my book. Fallen Angel however looks as I describe above. Grain is slightly coarser for one, but still completely beautiful. Stability etc. also. All par for the course now when you're looking at what's coming from Schawn Belston's team at Fox. I know, it does look like 4K scans. Actually, I think the booklet might be wrong, but I asked Jill Reading weeks ago if she could have a look and tell me the sources for the movies, and she ended never coming back to me (sadly, because she usually answers). Lucky you! I think Nick's confirmed already WTSE is a 4K master and BFI"s texts are not gospel. Whirlpool looks just as pristine. I mean so does Fallen Angel but it has that wonderful textural print quality (very high chiaroscuro high contrast la Shelle B&W nitrate luxe) which is just as gorgeous. They've (Fox) also cleaned up two slight frame tears or timing notches on edits that were just visible in the older Fox DVD. (Both during the late sequence of Eric waiting outside the cafe for June to drive over and pick him up. tenia wrote: I think that's both good news and not so good news. Assuming - who would know? - it's in safe hands like David MacKenzie's the new 2k and encodes should be very good. Just to clear something up - my credit in the booklet for this set is a misprint. I wasn't involved with BFI's Otto P set. Not that I want to intentionally distance myself from it or anything (I haven't seen it but I'm sure it's good) - just to set the record straight.